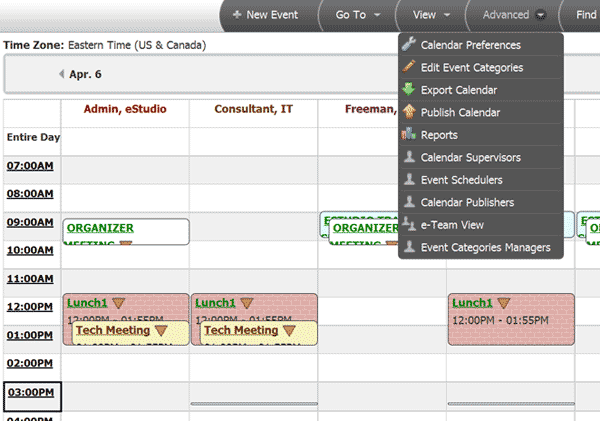 Manage the company schedule online with eStudio's calendar software. You and your employees can track appointments, events, meetings and tasks with ease and efficiency. Automatically send meeting notifications and reminders via email and SMS text message. Managers can create supervisor reports on staff & facility activity. No matter how big your team or how daunting your schedule, eStudio 7 is the online calendar solution that can manage the schedule for any type of business. Scroll down to discover some of the ways our calendar can make a difference in your company scheduling. Our calendar navigation is easy for everyone to use. 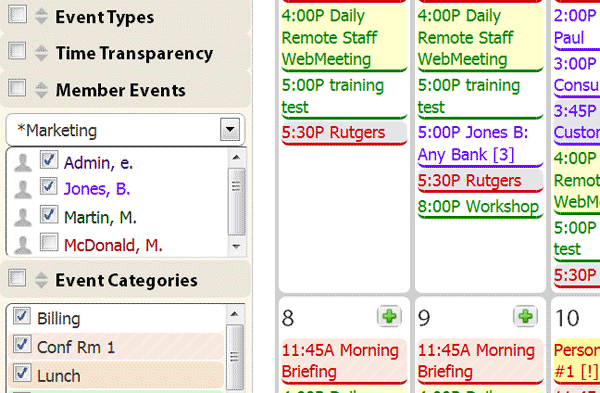 Each person can see meetings they are invited to attend. Checking the filter boxes turns on/off various calendar categories. Manager can check the filters to see worker schedules. Create eTeams to protect data so specified groups of users see events important to them without putting the rest of your business activity at risk from prying eyes. Adding a personal meeting is easy. A simple click gets you started- just fill in the first tab of information. But eStudio Calendar does so much more- invite team member, set location, send change notices, auto reminders, add details, invite outsider to events, make events recurring. See your business schedule your way. 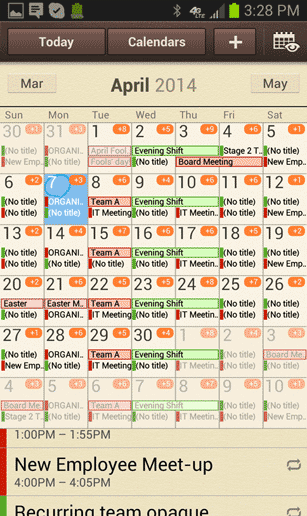 Day, weekly, monthly, specified work days, by category, by eTeam, by available users. Get automated reports about which people did what on which days by email. eStudio does things no other calendar does. Availability checker, scheduler tool, attach data forms, publish calendars to a URL, multiple reports, color/gradient backgrounds, and change notices are just some of our robust functions. Everybody can rely on our messaging solutions to stay connected with your business documents. SMS text alerts and emails are consistently delivered to the right people, making the management of schedules easier. Import eStudio calendar to Outlook. Share your eStudio with Google calendar, iCal, or Lotus. Publish calendar to special pages on your website. eStudio is easy to deploy. There is no need for special IT provisioning. Just enter names, email addresses and set access rights before sending new user invitations. The Administration area lets you easily add or remove people and grant advanced permissions. Apply your own color scheme, add your logo, customize invitations & integrate login form into your site. If a simple calendar or a dry-eraser board is no longer appropriate for your business. If you are ready to get everybody & everything scheduled. 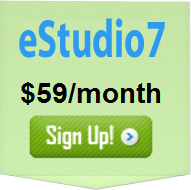 It is time to sign up for eStudio. Whether your business is a small company managing a few employees or a large enterprise with hundreds of worker and many different categories of events eStudio's online calendar software can be customized with just a few clicks to work your way.